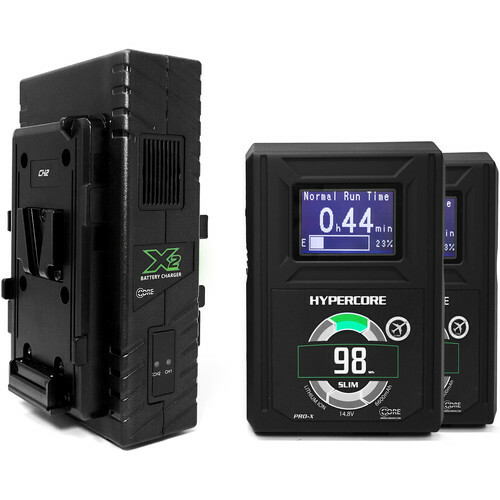 Provide power to your portable professional video and cinema equipment with this Core SWX HyperCore Slim 98 2-Battery Kit with X2S Vertical Charger from B&H. The HyperCore Slim 98 batteries are high-capacity, 98 watt-hour lithium-ion V-mount batteries, which, despite their slim profile, are capable of supporting up to 10-amp continuous draws. The included X2S vertical charger has two bays to replenish both batteries at 2 amps simultaneously, in around 3.5 hours. If you charge a single battery, a 3-amp charge will be provided, fully charging the battery in around 2.5 hours. Put your batteries on to charge before a shoot, and you'll be ready to roll during production. For more details on the products included in this kit, check out the features below. Charge your V-Mount batteries while on-the-go with the Core SWX X2S 2-Bay Vertical V-Mount Battery Charger. Taking advantage of the same technology built into the larger fleet chargers, this slim charger can charge a single battery at a 3-amp rate or batteries in both bays simultaneously at 2 amps. Since it sits vertically with two batteries mounted, the X2S takes up less space than traditional chargers. With its 4-pin XLR output, the X2S also does double duty as a 90W power supply for cameras, lights, or other equipment that can draw from a 4-pin XLR. Box Dimensions (LxWxH) 8.0 x 5.3 x 4.9"